Ideal for all your jewelry making and beading projects, this plastic storage box contains an wide assortment of bright glass beads. Use these many colorfull glass beads to design necklaces, bracelets, craft and earrings decorate everyday items and so much more. Size : 8x7.5cm. Packaging Details Our normal packing is in a polybag and also packing can be done as per your instructions. 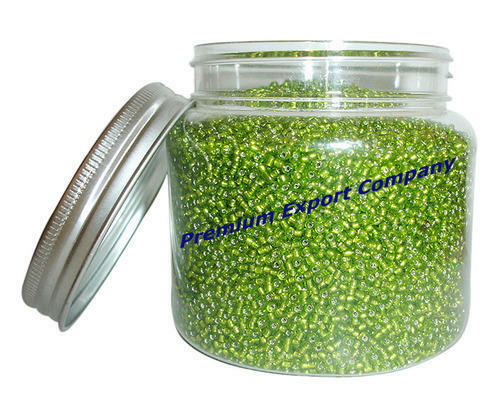 For Bulk Order : We Have separate safe packing to avoid breakage. Premium Export Company is a leading manufacturer and exporter of large range of Beads, Beading Supplies, Artificial Jewelry, Handicraft Products and Silk Fabrics since 1990. The company has been offering highly captivating range to the clients reckoned for brilliant designs, styles, shine, polish and durability accompanied by excellent customer services in regard to the competitive pricing, prompt response, minimum shipping charges, fast delivery system, regular updates on processing status, complaint handling and resolving it etc. We ship our products worldwide using Express Service of FedEx, TNT, DHL, UPS courier companies. We have a team of skilled and experienced craftsmen, designers and professionals, which works hard to provide the best to the clients. Products manufactured by us include glass beads, Lampwork beads, furnace beads, millefiori beads, silver foil beads, gold foil beads, pony crow beads, chevron beads, cane beads, Kashmiri beads, ethnic beads, metal beads, sterling silver beads, bone beads, horn beads, terracotta clay beads, resin beads, chrochet woven beads, mother pearls MOP beads, wooden beads, soapstone beads, acrylic beads, semi precious beads, pendants, charms, clasps, split ring, jump ring, head pins, eye pins, earrings and other findings, leather cords, cotton wax cords, elastic cords, plastic nylon threads, silk yarn, tiger tail, artificial jewelry and handcrafted products etc.